CedarWorks has always impressed us with their dedication to beautiful and sustainable designs for kids, and now there's even more to love as the company rolls out active playsets that are perfect for space restrictions and all budgets. CedarWorks stylish and eco-friendly playsets come in three different series this summer: the architecturally-inspired Serendipity Series, the new ultra customizable Frolic Series and the budget-friendly, ready-to-go Play-a-Round Series. No matter which series you go with, you can be sure that all of these playsets are made with splinter-free, chemical-free, maintenance-free Northern White Cedar wood. 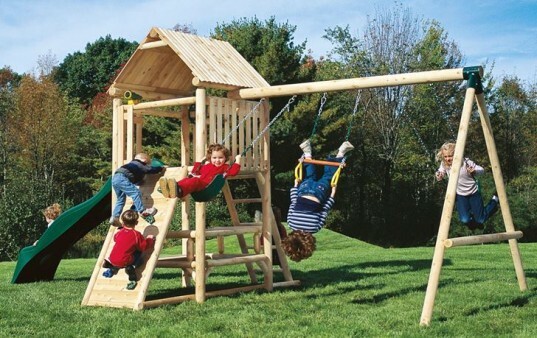 CedarWorks uses the same wood regardless of playset price and this is a feature only available at this company. If you're ready to invest in some outdoor summer fun for your child, keep reading to learn more. Play-a-Round swing sets come in three different pre-boxed models for you to choose from and each is loaded with fun features. Play-a-Round makes it easier to choose a pre-made playset because each is designed with the time-tested play items and accessories kids like best. Plus, these sets are made to last, using precision turned posts and traditional mortise-and-tenon construction. The Frolic series is the most versatile offered by CedarWorks because it’s designed to specifically grow with your child and family. Frolic playsets feature oversized structural beams, less plastic, less metal, and a unique modular system that offers tons of custom options for your changing family. You can start off with a large or small playset that’s simple or ultra magical and then change it as you see fit. Visit CedarWorks to see how Frolic can change through the years as your child grows. 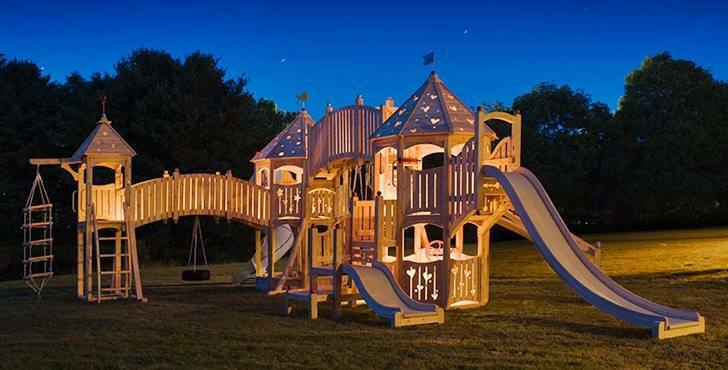 The Serendipity series is the most magical outdoor playset series offered at CedarWorks. Serendipity playsets offer craftsmanship with hints of classical architecture and the beautiful aesthetic values you might see with artisan-crafted furniture. Every Serendipity swing set is custom configured for the family who orders it and there are options galore to choose from including rock walls, activity ladders, swings, slides, interior play areas and so much more. 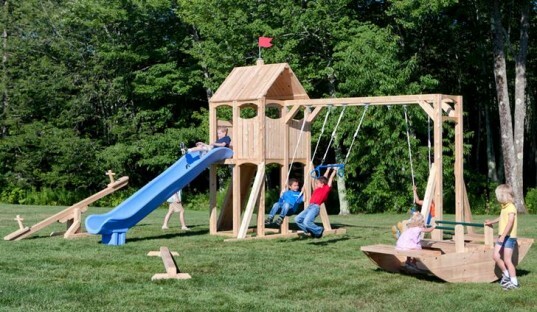 Choosing the right materials, wood especially, is very important when it comes to outdoor playsets. You want safe materials that won’t harm your kids, but because a playset is a major investment for most families, you also need materials that can stand up to weather, time and your active kids. CedarWorks fits the bill. All CedarWorks outdoor swing sets are made exclusively from Northern White Cedar, a wood that offers natural strength, long life, and no splinters without added chemicals. Northern White Cedar is also naturally rot and pest resistant. You can get playsets that are plastic-free as well, depending on the accessories and components you choose. Colored components of CedarWorks products are finished with stains that perform well below state and federal VOC emissions regulations. Super safe construction: Mortise-and-tenon joinery, post-and-beam construction, weight bearing braces, and oversized timbers add up to years of fun without compromising safety. ReCedaring program: CedarWorks has a comprehensive ReCedaring program that donates thousands of seedlings every year to small woodlot owners and environmental groups. To date, CedarWorks has donated more than 450,000 seedlings. Eco-manufacturing: CedarWorks facilities are run by bio-fuel and green electricity. Home-grown ethics: CedarWorks swing set components are made at a local facility in Maine and at small family-owned cedar mills in Maine and Canada. The people making CedarWorks sets receive living wages, good benefits, and safe workplaces. Recycling ethics: Leftover White Cedar wood is used for composting, heating, and horse stall bedding. At the end of its life, you can recycle your playset. Donations: 10% of CedarWorks profits are given to organizations which support kids and the environment. If you know exactly what you want, you can order away at the CedarWorks website. They make ordering online a snap. If you’re not sure about the best playset for your family, you can work with a CedarWorks design expert who will help you sort out the details. To learn more about pricing simply sign up for a preferred access account (I tested this and it takes just seconds to sign up). Once signed up you can download their current price sheets. Right now, playsets start at under $2,000, which is extremely affordable when you consider the safety, fun and life-span of your playset. CedarWorks ships playsets to all 50 states, Canada and most other countries around the world, usually within 1 -2 weeks of your order. The company has a nationwide network of playset installers available to help you bring your new playset to life, so no worries about building the whole playset yourself. 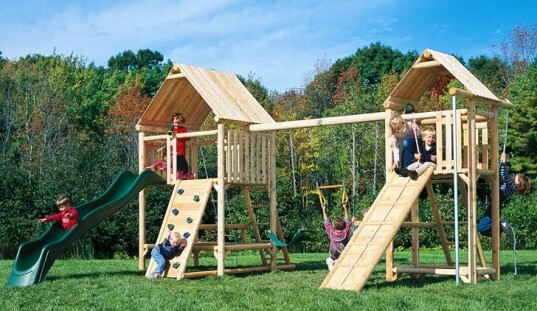 Note, this company also offers wonderful indoor playsets for year-round play. Contact CedarWorks today and make it a summer to remember for your kids. The Frolic series is the most versatile offered by CedarWorks because it's designed to specifically grow with your child and family. Frolic playsets feature oversized structural beams, less plastic, less metal, and a unique modular system that offers tons of custom options for your changing family. You can start off with a large or small playset that's simple or ultra magical and then change it as you see fit. Visit CedarWorks to see how Frolic can change through the years as your child grows. Choosing the right materials, wood especially, is very important when it comes to outside playsets. You want safe materials that won't harm your kids, but because a playset is a major investment for most families, you also need materials that can stand up to weather, time and your active kids. CedarWorks fits the bill. All CedarWorks outdoor swing sets are made exclusively from Northern White Cedar, a wood that offers natural strength, long life, and no splinters without added chemicals. Northern White Cedar is also naturally rot and pest resistant. You can get playsets that are plastic-free as well, depending on the accessories and components you choose. Colored components of CedarWorks products are finished with stains that perform well below state and federal VOC emissions regulations. 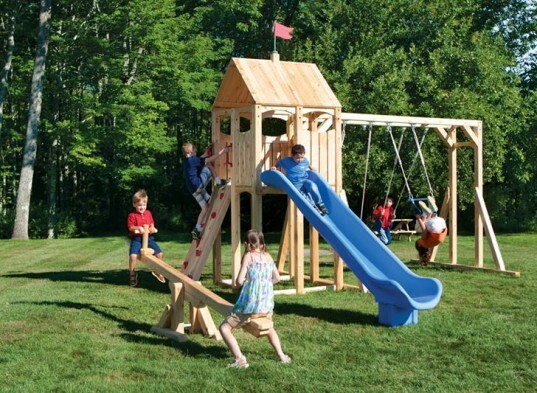 The CedarWorks company offers a slew of safety and eco-perks you won't find at other playset companies. For example: Super safe construction: Mortise-and-tenon joinery, post-and-beam construction, weight bearing braces, and oversized timbers add up to years of fun without compromising safety. ReCedaring program: CedarWorks has a comprehensive ReCedaring program that donates thousands of seedlings every year to small woodlot owners and environmental groups. To date, CedarWorks has donated more than 450,000 seedlings. Eco-manufacturing: CedarWorks facilities are run by bio-fuel and green electricity. Home-grown ethics: CedarWorks swing set components are made at a local facility in Maine and at small family-owned cedar mills in Maine and Canada. The people making CedarWorks sets receive living wages, good benefits, and safe workplaces. Recycling ethics: Leftover White Cedar wood is used for composting, heating, and horse stall bedding. At the end of its life, you can recycle your playset. Donations: 10% of CedarWorks profits are given to organizations which support kids and the environment. If you know exactly what you want, you can order away at the CedarWorks website. They make ordering online a snap. If you're not sure about the best playset for your family, you can work with a CedarWorks design expert who will help you sort out the details. To learn more about pricing simply sign up for a preferred access account (I tested this and it takes just seconds to sign up). Once signed up you can download their current price sheets. Right now, playsets start at under $2,000, which is extremely affordable when you consider the safety, fun and life-span of your playset. CedarWorks ships playsets to all 50 states, Canada and most other countries around the world, usually within 1 -2 weeks of your order. The company has a nationwide network of playset installers available to help you bring your new playset to life, so no worries about building the whole playset yourself. 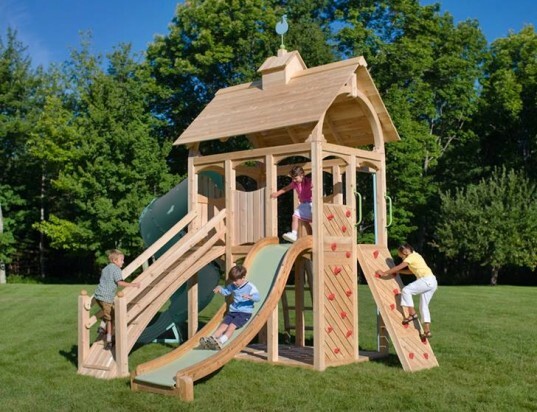 Note, this company also offers wonderful indoor playsets for year-round play. Contact CedarWorks today and make it a summer to remember for your kids.